Religious leaders associated with the "quiverfull" ministry announced intentions for a November retreat this year in Wichita, Kan., at which parents will meet to plan "arranged" Christian marriages for their prepubescent daughters, to maximize the future couples' childbearing potential—supposedly the No. 1 priority of all females. Quiverfull activist Vaughn Ohlman has written that female fertility is optimal during their teens (actually, just after age 12) and drops off in their 20s. The local district attorney, queried by The Wichita Eagle, said such marriages are legal as long as all parties consent—but Ohlman has maintained that the Bible does not require the bride's consent if her father has given his. • Apparently, Japanese taste buds easily become bored, for manufacturers seem eager to create extravagant food combinations to satisfy them that might prove daunting to most Americans. The latest exhibit: the familiar Kit Kat chocolate-coated wafer—but with the taste of ripe melon and cheese (specifically, "Hokkaido Melon With Mascarpone Cheese"). As Japanese foodies know, Kit Kats in Japan come in at least 15 coatings, according to a 2013 review by Kotaku.com, including Edamame Soybean, Purple Sweet Potato, Hot Japanese Chili, Matcha-Green Tea, Wasabi and Red Bean Sandwich. • The Daily Pakistan newspaper, covering the Anti-Terrorism Court in Karachi in April, reported that a judge in Courtroom III asked a constable if he knew how the grenade entered into evidence worked. Rather than assume that an explanation was requested, the constable pulled the pin to demonstrate, and the resulting explosion injured the constable, a court clerk and another police officer. The constable is said to be facing severe discipline as soon as he recovers. Great Britain's prisoners claiming to be adherents of the ancient Celtic pagan religion are allowed, under rules from the National Offender Management Services, to be excused from jailhouse routines to celebrate four festivals, including (of course) the Festival of the Lactating Sheep. Although "Skyclad," or naked worship, is forbidden, prisoners can wear the silver pagan ring (to avoid "distress") and are permitted their own chalices, crystals, "worry beads," pentagram necklaces, hoodless robes and flexible twig-wands. • An Israeli man (unidentified in press reports) petitioned the Haifa Magistrate's Court recently for a restraining order against God, pointing out that the Almighty has exhibited (according to a May Times of Israel report) "a seriously negative attitude toward him," especially over the previous three years. The judge rejected the petition even though God was not present to argue against it (or at least His presence could not be detected). Houston's KHOU-TV revealed in May that the French teacher at the Houston school district's Energy Institute High School doesn't speak French (but did take one year of it, in high school). • The Sheldon school district near Houston admitted in May that a 7-year-old student at Sheldon Elementary had written her own successful "please excuse Rosabella early" note (using lettering typical of 7-year-olds) and was allowed to go home instead of attending her after-school program. • School police at Christa McAuliffe Middle School in Houston threatened to arrest a 13-year-old girl during the last school year because they were unaware that the girl's $2 bill (cafeteria payment) was valid U.S. currency. In April, police in Brighton, Ontario, responded to what was reported by neighbors as a domestic dispute, involving shrieks like, "I hope you die!" They found only a man "arguing" with his pet parrot (who the man said was "beaking off" at him). No arrests were made. • Kayvon Mavaddat, 28, was arrested in Natick, Massachusetts, as police enforced three arrest warrants. He had been on the loose until May 6, when he politely (inadvisedly) held open a door at Natick Mall for a police officer who, in that brief moment, thought he recognized Mavaddat. Checking his cruiser's computer, he found the warrants, went back inside and arrested Mavaddat. Timothy Trammell, 36, was arrested on several charges in Jonesville, South Carolina, in May after a sheriff's deputy spotted him spray-painting a car that was not his. According to the deputy's report, Trammell had just finished angrily painting "C-h-e-e-t-e-r" (sic) on the car (belonging to a woman, identified in a WSPA-TV report as his girlfriend). • The Veterans Affairs hospital in Tomah, Wisconsin, among the system's most troubled (in personnel issues, falsifying reports and overdependence on patient opiod use), is reportedly working on a "100-day plan" for reform and recently posted a job opening—for interior decorator ($77,000 position, doctoral degree) to, presumably, improve everyone's attitude. 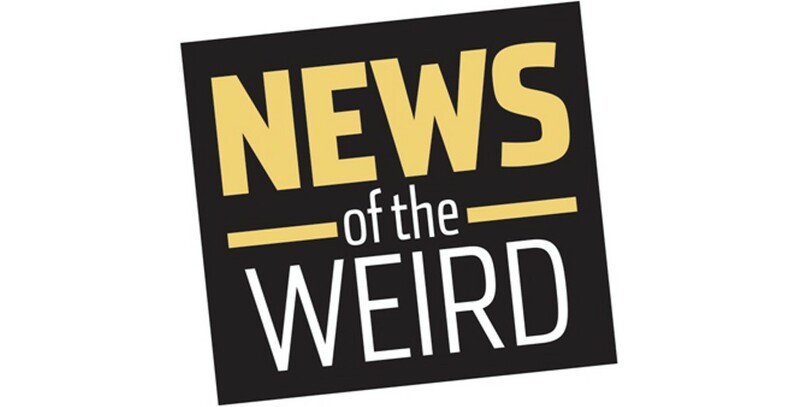 Thanks this week to Dan Bohlen, Greg Hoggarth, Stan Kaplan and Robin Daley, and to the News of the Weird Board of Editorial Advisors.